This Demonstration shows how the pressure in a fluid is affected by rotation at constant angular velocity. Use sliders to vary the fluid density and angular velocity. 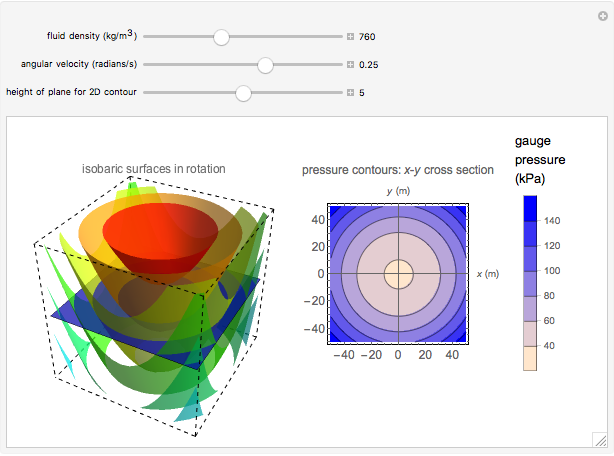 The 3D graph on the left shows the isobaric surfaces (surfaces of constant pressure) that result from the rotation. The graph on the right shows pressure contours taken from a cross section in the plane; a darker color indicates higher hydrostatic pressure. 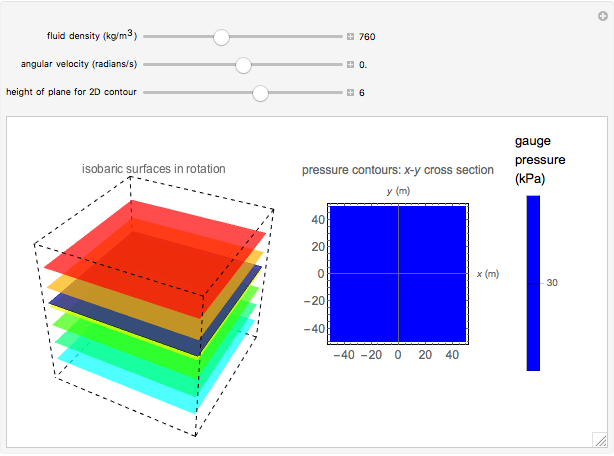 The cross section is represented by a blue plane on the 3D graph; select the height of the cross section with a slider. The pressure profile does not depend on the direction of the angular velocity. This physical situation is closely analogous to Newton's classic rotating-bucket experiment. where is the pressure in the fluid (Pa), is the radial distance from the center (m), is distance from the tank bottom (m), is fluid density ( ), is angular velocity (rad/s), is specific weight ( ), is acceleration due to gravity, is a constant estimated as ( ), where is fluid height (m). Megan Maguire and Rachael L. Baumann "Pressure of a Rotating Fluid"